Synopsis: Directed by Dustin Hoffman in his directorial debut, set at a retirement home for retired musicians, the annual concert to celebrate Verdi’s birthday is disrupted by the arrival of Jean, an eternal diva and the former wife of one of the residents. 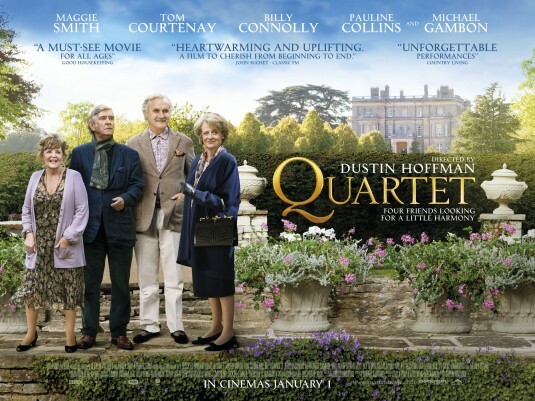 Review: Quartet is a story that is set in an retirement home for aging musicians, on the English country side. The story revolves around two central plot points, one being the annual retirement home fund raising concert, the other being the arrival of Opera star Jean Horton played deliciously by Maggie Smith. The cast is rounded out by brilliant English actors, each bring their own eccentricities to the roles they play. As Jean Horton arrives Cedric, played by Michael Gambon, an actor remembered as Dumbledore in most of the Harry Potter movies, is directing the gala event. He decides, she and Reginald, (Tom Courtney), Wilf, (Billy Connelly), and Cissy, (Pauline Collins), should recreate their famous Quartet from Rigoletto. Complications set in when we find out that Jean and Reginald where once married. Reginald wants nothing to do with Jean and retreats. Wilf plays mediator between the two, and has all the crass and funny lines. Maggie Smith has all the droll understated lines and her comebacks (see Downton Abbey) are swift and deadly. Smith is an international treasure, she shines in everything she does. Pauline Collins has the task of making her character Cissy, a little dotty in the head, obviously very forgetful, perhaps early Alzheimer’s, and she navigates through it all with a sense of irony and comedy. Collins remains indelible as the main character in the film Shirley Valentine, here she is just as delightful. Comedian Billy Connelly as Wilf, is a crass womanizing retired Opera star. His comic timing plays counterpoint to Smith’s dry wit. He delivers a multi-layered performance and brings a sparkle to an otherwise dry screenplay. If you are unfamiliar with Connelly, their is plenty of him and his stand-up on You-Tube. In Scotland, his home of origin. he is known as the Big Yen. There is more on him at http://www.billyconnelly.com. Tom Courtney, who first appeared in Dr. Zhivago so many years ago, plays Reginald as a deeply wounded individual. Jane had left him when they were married and hardly said goodbye. The two together Smith and Courtenay, play against each other with compassion. Reginald’s distrust of Jane is juxtaposed with his feelings of love for her, this is where Cortnenay shines. Michael Gambon as Cedric, puts up with all the backstage drama so that he ultimately gets what he wants. His transition from lack of patience to restraint is apparent. It appears that everyone but the the four leads bend over backwards to make Cedric happy. He delights in the gala more than anyone else involved. Gambon is fun to watch, especially at the times when his plans seem to get foiled. The film is is light and plays like a classic chamber comedy. Hoffman chose wisely his directorial debut. The film might appeal to the older demographic and certainly to the those who enjoyed The Marigold Hotel.